This v2.0 application was designed and developed by our team based on a successful MVP also created by ourselves. The app is extremely simple and intuitive to use with the help of many visual aids to convey complex information in an easy to interpret way. 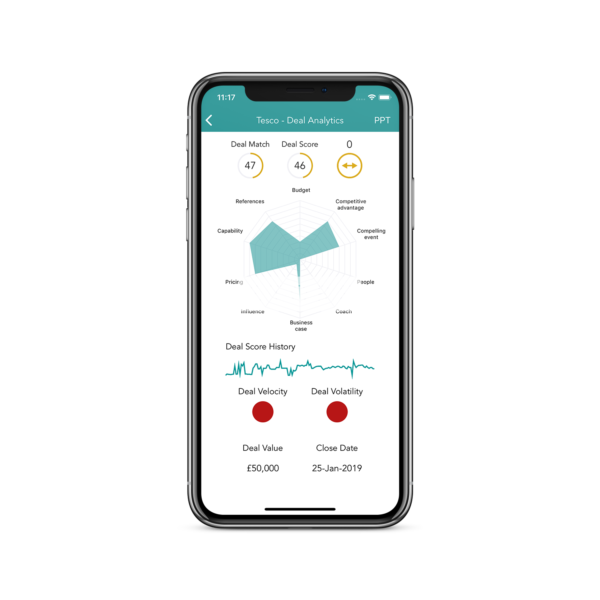 The data processing to create this app follows some complex principles, however, our client didn’t need to worry about this as the heavy lifting is done for them by the application. They get all the information they need without needing to rely on a person to make the calculations for them. The app allows both sales team members and sales managers to view all potential deals to be had with prospective clients. It then allows them to answer a series of questions which, in turn, can be used to calculate the potential of each deal. This can be used to both monitor sales activity and also to manage the performance of the sales people over time. Furthermore, it can be used to monitor seasonal trends. Sales managers can keep track of their team members through the app with graphical aids to measure and encourage performance. There’s no complicated user interface to learn how to navigate so team members at any level of technical ability can pick up how to use the software with relative ease. The app was developed for both Android and iOS.